Who wants to see a movie on us? Here is your chance! But be quick! The movie 'Crimson Peak' and it's the latest fantastic offering from director Guillermo del Toro, a gothic romance thriller starring Mia Wasikowska, Jessica Chastain, Tom Hiddleston, Charlie Hunnam and Jim Beaver. 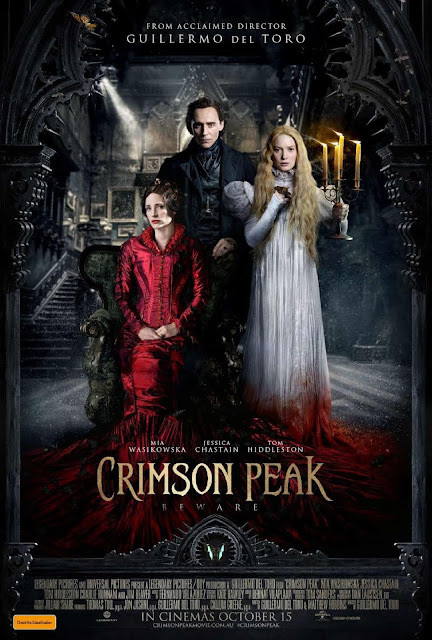 'Crimson Peak' releases in Australia on October 15, and there will be a special preview screening the night before - on Wednesday 14 October - at Event Cinemas George Street, Sydney at 6.30pm. And THIS is the event you're invited to! - Comment below on why you'd like to win this prize AND email me at josiegags@optusnet.com.au so I can contact you in case you are a winner. If you don't enter a valid email address I spend lots of time trying to track you down, or simply give the prize to the next person - not fun for anyone! *Competition is open to Australian residents only. Winners will be drawn on Monday October 12, 2015.